Save the date. We’re ready to Rock’n Stroll on September 23! This year the Walk Series includes awareness events in Florida, Colorado, Texas, and even a half-marathon in New York. If you’re ready to join the walk to stop the Rock’n, just click on the orange button. If you need a little more information, keep on reading. Walking isn’t the only way to Friendraise for the Foundation. There’s going to be a scrapbooking event to raise awareness in Texas, and we have a Friendraiser who’s running a half-marathon in the Hamptons, home to the affluent and influential. Keep visiting the blog for developing details. If you have something planned that you’d like to share, please leave a comment or shoot us an email. As I write this post, there are Teams being organized in New England and New Mexico, challenging one another to create the most awareness for the Foundation. 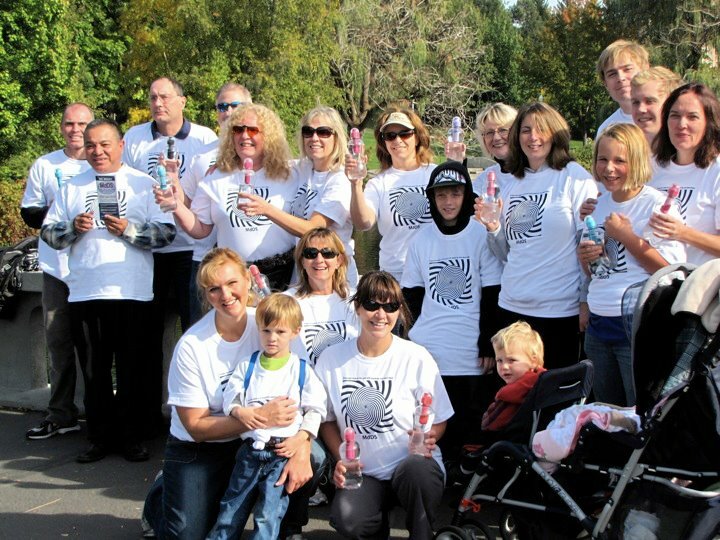 Last year, Team Spokane received a big box of Bobble water bottles, each valued at $8.99, for organizing a loud crowd and bringing in $450 to further research. Yay, Team! Don’t forget! The Walk Series is virtual, and you can join us as a cyberwalker wherever you happen to be on September 23. Please use the big orange button up top to register as a cyberwalker. We’ll put a Friendraiser pin in the Rock’n Stroll world map for you! The registration site also includes information on how you can share pictures of you and your friends in your Rock’n Stroll t-shirts for our photo gallery. Last but not least, for those of you who are unable to join us in the Walk Series but who still want to help, we’ve set up a special website for you. Thanks for being a Friendraiser! For those outside of Colorado, the 2012 Rock’n Stroll graphic tee is available for purchase in the MdDS Friendraiser Store. We’re working hard to get the price down, and to find Event Sponsors so we can give you t-shirts, too. But we could really use your help. If you know a business that is able to sponsor us – and can get their name/logo to us ASAP for inclusion on our t-shirts by the 23rd – we’d love to hear from you.